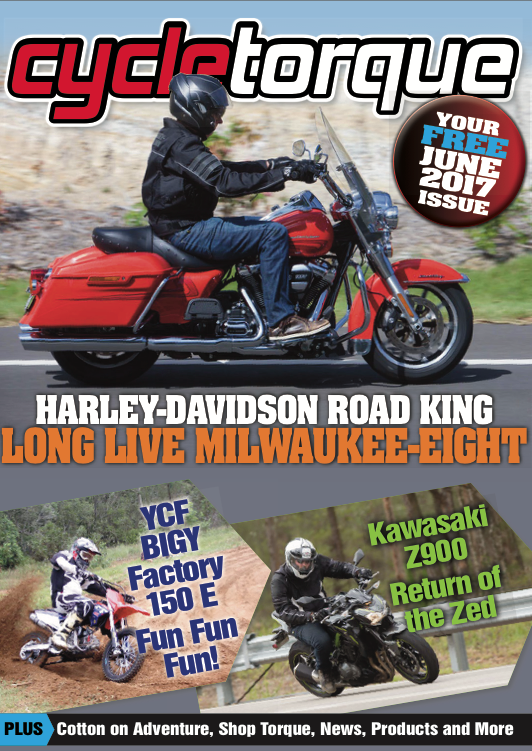 In the June issue of Cycle Torque is a full test of Harley-Davidson’s Road King with the new Milwaukee Eight powerplant. It’s bigger, smoother and breathes easier. Kawasaki is back with its venerable Z900, this big naked has been refined and it won’t break the bank either. Read the test. Smarty bought the YCF BIGY Factory 150E fun bike for the family. What got him over the line? Find out. Cotton’s reign continues with a rant on adventure bikes and our ex FZ6 Cup trackbike needs a new heart. There’s news, products and more. Hope you enjoy the issue.